Our third show of beautiful art, displayed in this prestigious Architecture/Design firm in Santa Monica, opened last week. 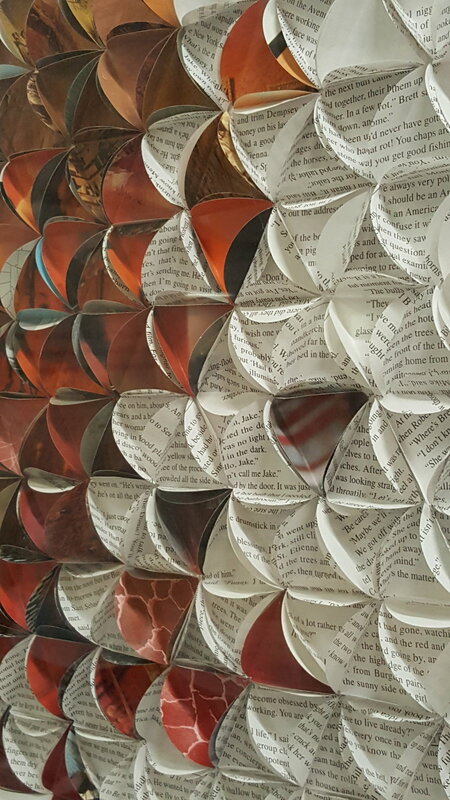 "Obsolete books and artist papers are re-formed, assembled, stitched, and mended into new objects. As tangible vessels of language and ideas, books as materials impart both content and form." --L.O. The artists says of her piece, Lacrimaria (for Paris): A lacrimarium is a tiny, hand-blown, glass vessel of the Roman era that was used to collect the tears of mourners, then buried with the deceased. The artist says of her work: Paris is personally significant to me, having studied and lived there as a student; it indelibly shaped me as a person and an artist. When the November 2015 tragedy struck Paris, I was moved to make this pod sculpture. It consists of 40 small vessels (for the 20 arrondissements plus the 20 years I was when I was there) made from a variety of French texts to signify the human sounds of the city, the voices and the messages that make a city’s thrum. A transparent aquarelle of blue is painted inside, with seven pods leafed in silver. A path of stitching runs through the forms signifying life and repair and endurance. The folding of materials fascinates since it is such a simple way of manipulating a material and giving it a subtle dimension. 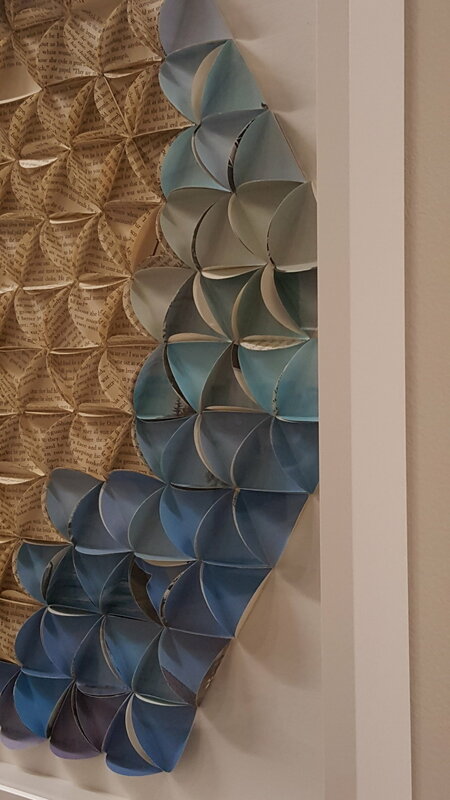 These pieces are called Momenti since each circle, with edges folded, contains a moment (an image or excerpt) and collectively, when assembled en masse, they become a fuller story.